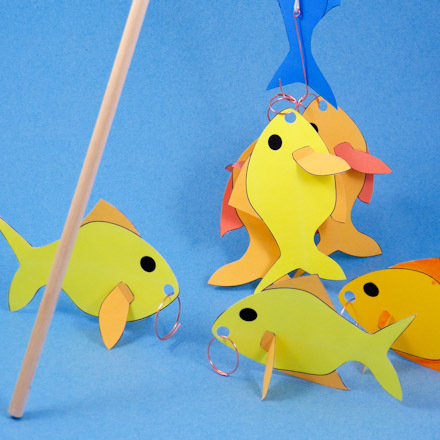 In this project, you will make 3D fish and, to catch them, a fishing hook and rod. Kids of all ages enjoy the fishing game, which can be made easier or more difficult depending on the children's capabilities. Children can improve eye and hand coordination playing this game of skill. The game can also be structured to teach colors, numbers or arithmetic. For pure fun, this is a terrific family activity, especially for granddads and grandkids. Everyone will have fun making and playing the fishing game! Included at the end of the project are the rules for playing the Fishing Game, and a bit about the origins of games of skill. Optional: Markers, magnet, paint or varnish. Choose the pattern you want to make. Download and print the pattern. For the fishing game, you will want to make six or more fish (minnows are a kind of small fish). 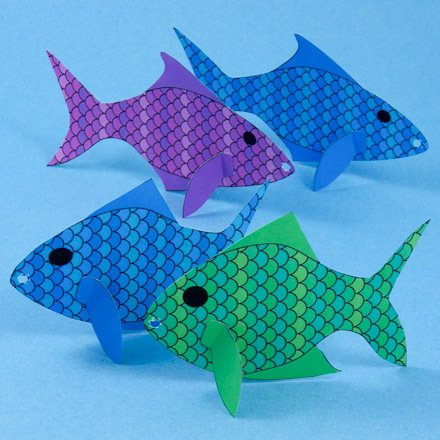 If you print on paper, each pattern will make two fish, since the fish are double-layered. Choose a design that prints in color, or select a black & white (B&W) pattern and use your creativity to add color and designs. To make lots of fish quickly, print the black & white patterns on colored cardstock. Color the fish with any colors you like. Be sure to color both sides of the fish. 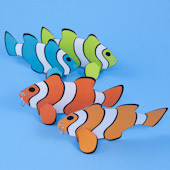 Tip: If you printed on cardstock, you may find it easier to color the reverse sides of the fish after they are cut out. If you printed on paper, make double-layered fish by cutting the rectangles surrounding each pair of fish on the gray outline. Fold the paper in half along the middle gray line, carefully matching corners. Glue the two halves together. After the glue is dry, cut out the fish on the black outline. Do the same for the side fins. Each pattern makes two double-layered fish, each with a pair of side fins. If you printed on cardstock, cut out the fish and side fins on the black outlines. Each pattern has four single-layer fish and a pair of side fins for each. Tip: Make a more accurate fold by first scoring the fold line with an empty ballpoint pen or bone folder. Align a ruler along the fold line as a guide when scoring. Use your ¼" hole punch to make a hole in the nose of each fish. Use the dashed gray circle as a guide. Fold back a ¼" tab at the base of each side fin. Glue the side fins to either side of the fish on the short dashed gray line. Tip: Keep in mind that the right and left side fins are the reverse of each other. After the glue has set, fold the side fins out and stand up the completed fish, with the side fins providing support. 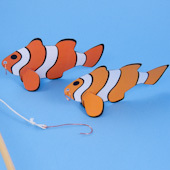 Make a wire ring to slip through each fish's nose for hooking the fish. The size of the ring determines how difficult it is to catch a fish. Make larger rings by cutting a 3" length of 20-gauge wire and wrapping it around a glue stick. For smaller rings, cut a 1½" to 2" length of wire and wrap it around the barrel of a thick marker. Make one ring for each fish. Use the needle-nose pliers to help you form the rings. Each ring should have a short (¼" to ½") overlap, like those on key rings or jewelry jump rings. 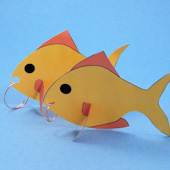 Attach a ring to the nose of each each fish. Do this by sliding the fish's nose through the slit where the wire ring overlaps. Turn the ring so that one end of the overlapped wire goes through the punched hole in the fish's nose. Tip: You can use paper clips instead of making wire rings. 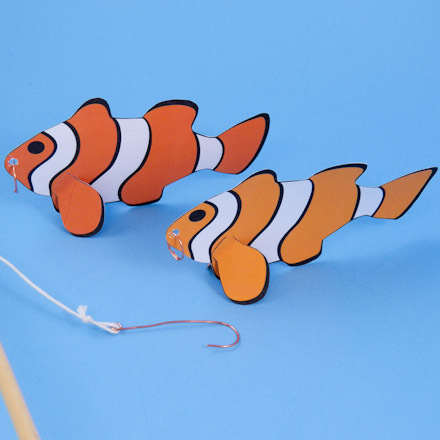 Cut a 2½" to 3" length of wire to make your fishing hook. Wrap one end of the wire around the glue stick to make a hook, and use the needle-nose pliers to make an eyelet at the other end. Make the rod from a 24" piece of ¼" dowel rod or a stick. Sand the rod to smooth the ends and remove any roughness. Cut a 24" length of string and tie one end around the tip of the rod. Secure the string with a drop of glue. Tie the hook to the other end of the string. 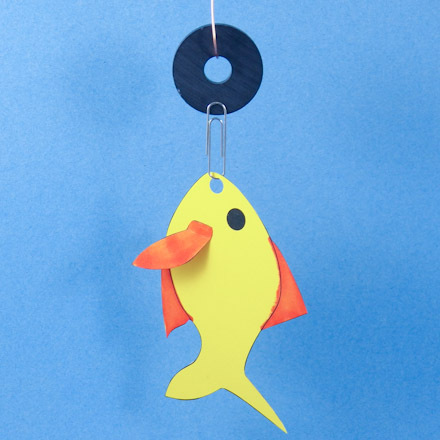 Tip: For younger children, make an easier game by using metal paper clips on fish that are caught with a magnet. Use a 1" or larger circular or horseshoe-shaped magnet, and tie it to the end of the string instead of a hook. You can also make the rod and string shorter, if needed, to fit the children. You will need six or more fish, a hook and rod, and a watch or timer to play the Fishing Game. You also need pencil and paper to keep score. Two or more players can play. The object of the game is to be the first player to score 25 points. With four or more players, you can play in teams, with the first team to earn 50 points being the winner. Put the fish on the floor, standing them up with the side fins used as supports. The players stand around the fish in a circle. If you like, make a pond shape with rope or cord and put the fish inside the pond. The youngest player goes first, and then play goes clockwise around the circle. Set the timer for 3 minutes, and say "Go!". The player sees how many fish he/she can catch before 3 minutes are up. Count the number of fish caught and award 2 points for each. Write the score on a piece of paper. Go on to the next player. For fish with smaller rings, score 3 points each. Keep fishing until one player has 25 points total—he or she is the winner! Tip: The time limit can be shortened to make the game more challenging. The winning score can be made smaller (10 points) or higher (up to 100 points) to make the game go faster or last longer. That's it! Now it's time to go fishing! What are the origins of games of skill? Games of skill originated as a way to learn the coordination needed to hunt. Although we have no record of them, these games probably originated in prehistoric times. We know from recent history that Native American children played many games that perfected their ability to throw, run, and aim. For example, in one game, a hoop is rolled along the ground while children try to throw sticks through it. What skills can you develop while playing the fishing game? Tip: The patterned fish have multicolored scales. 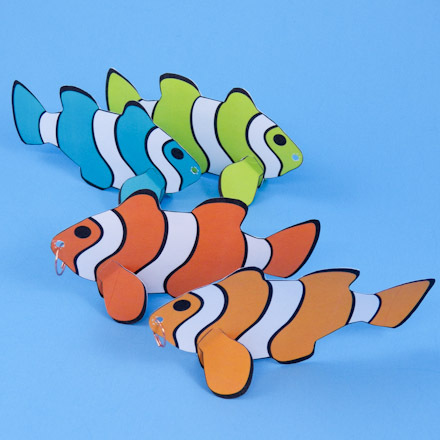 For a special treat, print these fish on glossy photo paper. 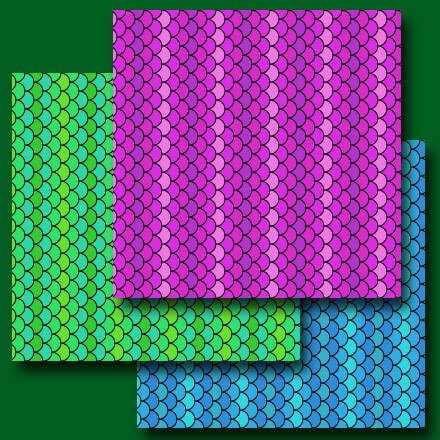 Tip: The Animal Scales digital papers come in Blue, Green and Pink and coordinate with the patterned fish. You can also use the digital papers for any animal craft requiring scales—fish, lizards, snakes, armadillos. Check out the Cardstock Animal Bookmarks craft project. 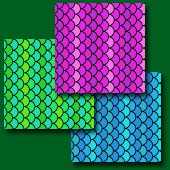 The Fish Scales digital papers include scales in other colors: Goldfish, Tropical and Red. To make fish with these scale colors, print a scales ePaper on a sheet of paper, and then over print the B&W fish pattern on the same side. Tip: Smaller rings are harder to hook. Increase the points awarded for hooking a fish with a smaller ring. Tip: Tie the string through the eye of the hook. Tip: For younger children make the game easier by fishing with a magnet. 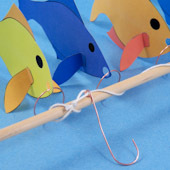 Attach metal paperclips to the fish and tie a magnet to the end of the rod's string. Tip: Clown fish are among the most popular aquarium fish. They are usually orange or black in color, but for the fishing game you can make them any colors you like.